Vandorff, deriving from a German family name, stands for a 'shining village'. Empathy towards nature and humanity are strongly ingrained in the name itself, as textile designer Shalony van Stralendorff forages for inspiration in a remote Scandinavian town. Textures lending Japanese air, dyes cooked up from organic harvest and care for environment are communicated throughout the company’s design philosophy. We take a ruminating walk in Vandorff’s inviting natural habitat. Creativity is something that has been a part of my life since I remember myself, and it affects me on a daily basis. I graduated from the Swedish School of Textiles three years ago. I did the Textile Design course there, and then I started my own company back in 2015. 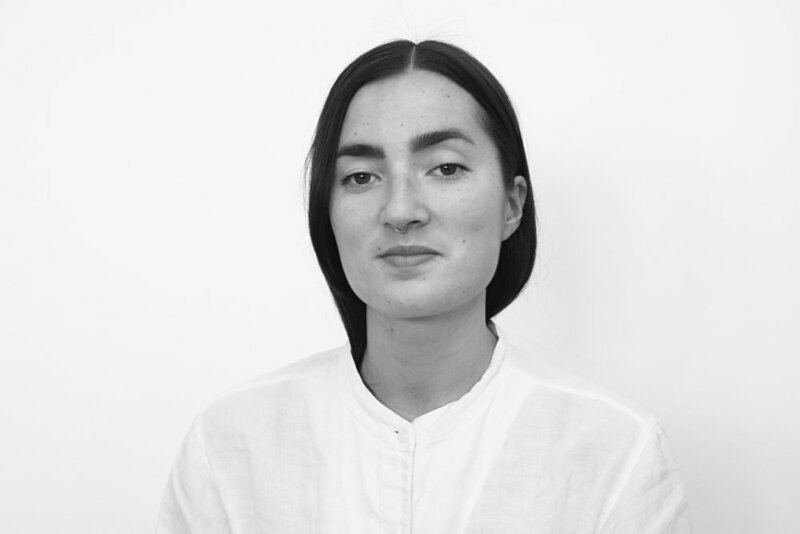 I chose to work with textile fibres because of my special interest in tactile techniques. Textile allows me to experiment with 2 and 3 dimensional mediums, and it also offers a various range of functional possibilities. Vandorff is a short form of my German family name, 'van Stralendorff', which means a 'shining village'. Vandorff reflects my passion for details, traditional methods, simple aesthetics, and pure design for daily life. And the brand's story also entails an aspiration for a more sustainable lifestyle. When creating a new product, what comes first: the textile or the object? The textile comes first, since I continuously ask others and myself what textile needs we have in our daily lives. Can existing products be further improved? What are our basic needs? Are our needs expanding? I instinctively observe how textiles work in my own home, and notice how quality and different materials affect the area of use. Textile has a great impact in our daily life with its various capacities, even if very subtle. It heats, absorbs, carries, stores, cleans or protects in one way or another. What was the inspiration and process behind your delicate, yet rustic kimono? I want to contribute with a more fair global trade; imposing the lowest possible environmental impact, and simultaneously generating employment for women. My passion for nature, colour and form guided me towards creating this genuine handcrafted kimono, with great empathy for humanity and nature. 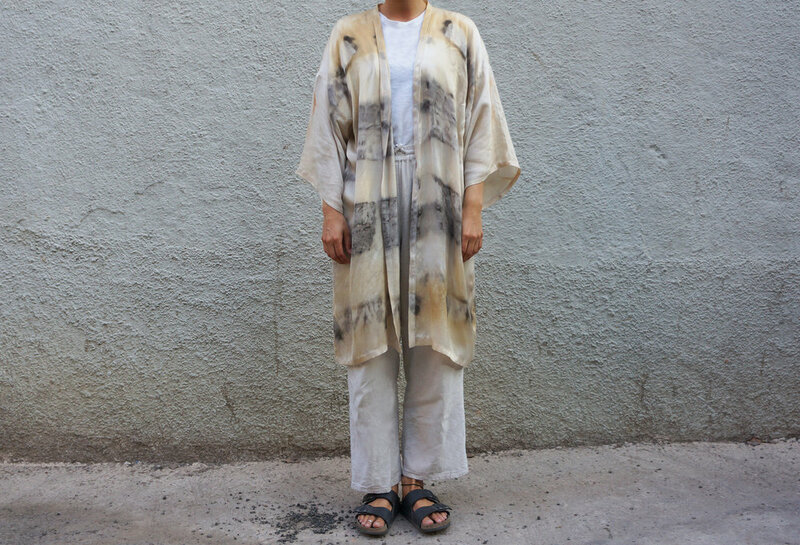 The kimonos are hand-dyed with harmless natural dyes, such as trees, rust, berries, mushrooms, and other things that I collect from my morning walks. "Textile has a great impact in our daily life with its various capacities, even if very subtle. It heats, absorbs, carries, stores, cleans or protects in one way or another." How did ceramics came to be a part of Vandroff’s oeuvre ? Vandorff's concept is focused on textures and textile. It’s based on creating functional everyday objects of different materials, such as textile, clay, glass, wood, stone or steel. Since my partner works as a potter, clay was a given material to explore. The existing Vandorff assortment will slowly grow and turn into a mixed range of genuine designed products made of various, but pure materials. Myriad of brands label themselves sustainable. What steps is Vandorff taking towards a greener world? The greatest environmental impact is determined in the early stages of our production chain. We aim to obtain and produce in small-scale quantities and create products with long-term sustainability in mind. A sustainable technique, such as natural vegetable dying, is something that we will keep exploring, too. Our production is primarily based in Sweden, but we also collaborate with, and thus support, local artisans based in India. We provide timeless, yet modern aesthetics, meant to last for several generations to come, and we work with compostable materials. Traditional handicraft and modern techniques are combined to achieve a handmade expression and deliver an intact quality. "We have to think of how our waste can build capital rather than reduce it. I believe this is where creativity and innovation could potentially merge." In moving towards a healthy fashion climate, what are the wise choices we as consumers can make in everyday life? Buy less and buy better, instead of supporting the 'throwaway and replace' culture. Avoid buying clothes made of mixed, synthetic and unbiodegradable materials. Swedish fast fashion giant H&M is planning to have a full circular economy system in place by 2030. What’s your take on that? I think that’s of utmost importance, especially since it’s one of the world’s biggest fashion companies. I hope their act opens up new perspectives and interconnects companies to redesign our future together. We have to think of how our waste can build capital rather than reduce it. I believe this is where creativity and innovation could potentially merge. That must be the magical chemistry of natural dyes!